1) Good Sam Bundles a Bad Deal for Many Parks. Good Sam charges the same for top destination parks as for remote parks. Bundles cost the same for LARGE parks (with large ad budgets) as it does for small parks. Their web bundles are VERY costly. Is their web site worth that much? That depends on the park’s location and the organic consumer interest in that location. Internet traffic is much lower for small properties which are not near well known destinations Popular destination areas just get more traffic (this is obvious if you think about it). This applies to both the whole internet AND on Good Sam’s web sites; there’s a large disparity in advertising opportunity between ‘top search’ and ‘low search’ destinations. Offering web bundles at a fixed price (one size fits all) means Good Sam bundle pricing is a bad deal for advertisers who naturally get fewer searches. CONCLUSION 1: Good Sam’s fixed-pricing doesn’t match the variable ad value. If you’re not a Member Park your non-GS park will (by default) not even show on the GoodSamClub web site. And on the public GoodSamCamping site non-GS parks will be at the bottom of the list . For both sites the web visit statistics for non-GoodSam parks are SO LOW it’s not worth the cost of the bundle. If you’re a non-member park you’re unlikely to turn up in search results on goodsamclub.com. You’re spending $1,695 or more for internet advertising with Good Sam. You should be able to see statistics which show the results. Asking your Good Sam reps for statistics may disappoint you for two reasons. A) their reporting is silly and B) their web traffic is too costly. Understanding GS provided stats is a little tricky. Some of their click-thrus are not clicking to YOUR SITE. Instead the reported clicks go to other pages on Good Sam’s site. Your modern marketing goal is to drive prospective customers to your web site. So the pricey online bundles should drive traffic to YOUR site, not theirs. FREE CONSULTING: Contact Strait Answers for help reading your ad bundle stats from Good Sam, or help in walking through your Google Analytics account reports. Web search is the main way people find travel information. Good Sam knows this and is working hard to build out their web presence—even advertising on Google search. Problem is the way Good Sam has been organizing campground listings is not compatible with the way people actually do searches. This matters because it means search engines are better tools than Good Sam. Search engines use the more natural and intuitive structure of keywords. Both the printed GS book and the web site use an old format: they require users to 1) select a STATE and then 2) select a CITY. So the camper has to know your city to even see your listing. On the web site they’ll return a list of the top advertisers within 25 miles of the city. Same thing in the print directory; again, you turn to a state section page THEN the cities are listed in alphabetical order. So users of the print directory will need to know the name of the city or town to find you. That’s great if your park is in a popular town. But for many rv parks that’s not the way it is. If you’re nearby but not in it, your listing will probably be missed by the consumer. They look for destinations, not towns near destinations. Way more people use Google for RV Park searches than they do Good Sam. Using the Google Keyword Tool, we measured the traffic for some common camping search words. The list below shows us that web searches for terms like ‘campground’, ‘camping’ or ‘rv parks’ happen millions of times per year. These searches reflect the consumers’ intention. They’re searching for camping places. General consumers mostly don’t search for ‘Good Sam’, which is a small directory by Google standards. Instead searchers go to explore the web using search engines (like Google, Bing, or Yahoo!) with direct key words for camping. The GS web traffic is a small fraction of Google traffic. Even still the GS web site users don’t view many RV park listings online. Good Sam media kit shows some round numbers to state the visitor traffic their web sites receive. The 2.8 million searches on www.goodsamclub.com sound like a lot of visitors. But for all the MILLIONS of web page views on Good Sam, on average each GS user only views one campground’s details page. CONCLUSION: Good Sam Can’t Match Search Engines (which are FREE!) 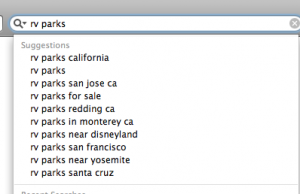 when it comes to getting your individual park in front of the most people searching for camping accommodations. CONCLUSION 5: GoodSam web traffic is not CLOSE to Google’s. Google advertising. You can place your park’s ad exactly on the pages consumers see when they are searching for YOUR destination, nearby destinations, or other popular searches of your choosing. With this search engine advertising you ONLY PAY if an ad is clicked to your web site. You can correct errors or shut the service off in an instant if needed. With Good Sam you pay a flat fee without regard for marketing benefit. Click Here to See Package Prices.